Gentleman in his mid 50's had chronic shoulder pain. Couldn't lift his 3 year old or reach behind his back without pain. He had been to his medical doctor, physical therapist and orthopedic doctor for answers. X-rays and orthopedics tests were not conclusive about the cause. Corrective exercises, stretches, medications did not greatly reduce or stabilize his shoulder. 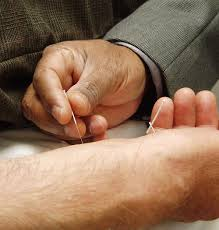 Acupuncture expertly applied will often improve and eliminate pain. How? Acupuncture corrects the movement of "Qi" through the meridians to every part of the body. The result is complete spinal alignment, balanced muscle groups, improved posture. 2 needles were able to take the rotation out of the shoulder girdle because of the improved posture. This gentleman has been pain free for 6 weeks to date. Each case is different. Some pain cases may require a series of treatments. We often see results in the first treatment. Their are many causes for pain. For simple joint and muscle pains, acupuncture works. These and more conditions are properly evaluated at Mosher Health to asses the causes of your pain. If you want to know if the benefits of acupuncture will help you Contact Us.